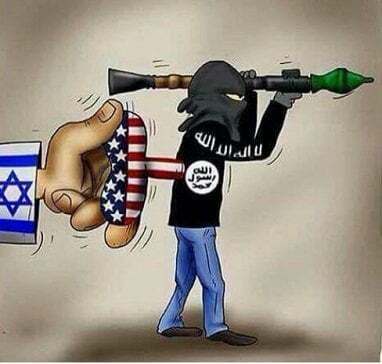 Amply documented, the Western military alliance are the State sponsors of both Al Qaeda and the ISIS. Why would ISIS “bite the hand feeding it”, providing it weapons? Makes no sense! Claims of responsibility lack credibility without verifiable proof. None so far exists. What’s known about Monday’s incident suggests false flag responsibility. They’re identifiable the way fingerprints ID people. They’re strategically timed for an intended purpose. They’re designed to capture world headlines, conceal responsibility of the perpetrator, and point fingers at a convenient patsy or patsies. On Wednesday, reports indicated Berlin police found identity documents (apparently a passport) belonging to a Tunisian national named Anis A. in the cabin of the truck used to kill and injure dozens on Monday. Following an earlier false flag attack, a cartoon on independent media showed an individual dressed in black, a suicide jacket strapped to his chest, his finger on the triggering mechanism, commenting “s..t, I forgot my passport” – mocking the absurdity of a criminal leaving identifying documents at the scene of the crime, making capture all the easier. The 9/11 mother of all false flags provided a treasure trove of information, showing what happened was other than the official narrative. Most obvious was how could a handful of terrorists outwit America’s 16 intelligence agencies, including sophisticated NSA eavesdropping on anyone or anything suspicious back then? No evidence implicated Al Qaeda. Official 9/11 claims were beginning-to-end contradictions and fake news – endless imperial wars following the elaborate hoax. False flags are a Western tradition, notably in America. Was the Monday Berlin attack and same day assassination of Russia’s ambassador to Turkey the latest examples? Were CIA dirty hands involved in either or both incidents? Were they linked to Aleppo’s liberation, Russia, Iran and Turkey trilaterally cooperating on cessation of hostilities and conflict resolution in Syria excluding US involvement, along with jihadist fear-mongering to pressure Trump to keep waging imperial wars and perhaps other reasons for what happened? When it comes to geopolitics, things are seldom as they seem. Truth is other than what’s widely reported.